Gas turbines manufactured by Siemens Industrial Turbomachinery Ltd., Finspang, Sweden. 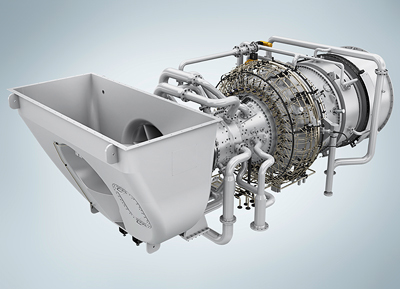 – A series of industrial gas turbine type SGT, power output from 4 to 50 MW, includes 9 types of models that are optimized for the needs of terrestrial energy. Some models have a modification for the use as a mechanical drive. 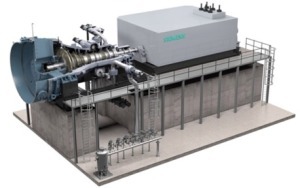 Small steam turbines manufactured by Siemens Turbomashinery Equipment (STE), Frankenthal, Germany. 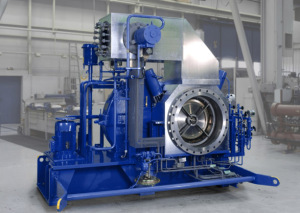 Steam turbines type SST, power output from 300 kW up to 12 MW, include 3 models. The turbines can be used both as a generator drive and a mechanical drive. A structural feature is application of 1 to 4 high speed single stage wheels for 1 generator. 2 wheel types are applied: axial and radial. Such design significantly reduces the weight, size, and thus the cost of installation, as well as ensures a rather large number of fast starts and stops. Steam turbines manufactured by Siemens, s.r.o., odstepny zavod Industrial Turbomachinery, Brno, Czech Republic. A series of steam turbines type SST with the power output from 10 to 150 MW includes 5 models. Turbines from Brno have a classic multi-stage structure, are usually used as a generator drive, but can also be used as a mechanical drive. Turbines feature: each turbine type is designed for the needs of a customer, and can be made for a wide range of power output, flow and parameters of live steam, extraction steam and steam behind the turbine.